Time for a little experimentation with high voltages. To see how well the concept of launching a ring using Eddy currents works, I wanted to do a more serious test. Just to get some feeling for its behaviour, since theory alone is a bit boring. Thus, with this first prototype, no optimisations or whatsoever are done. 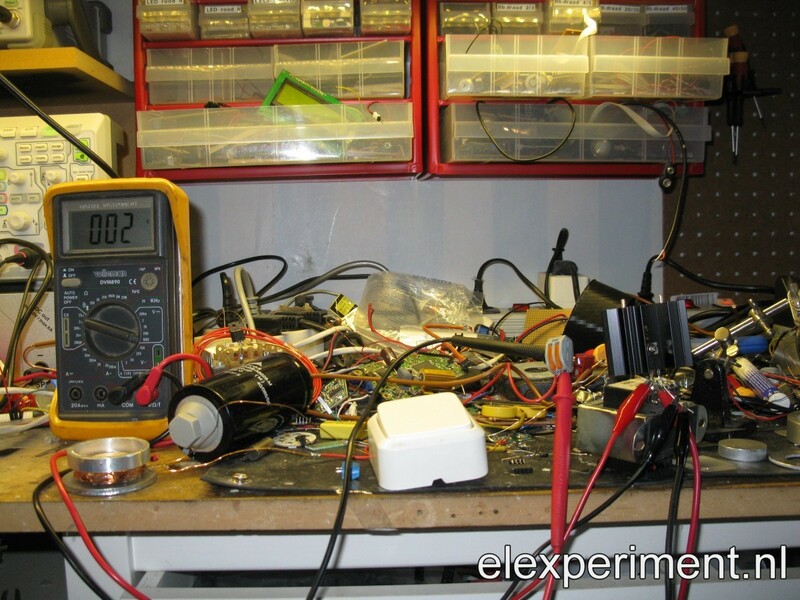 The components required for this experiment are quite simple. The most important part is to have a nice capacitor, in this case a 2200μF 400V capacitor. The coil is simply made from some 0.5mm magnet wire, wound on a piece of wood. The aluminium ring has an inner diameter of 40mm, outer diameter of 48mm, and height of 8mm. The current is switched with a standard 230V switch, which so far seems to handle the currents quite well. Sometimes it sticks a bit :). Thus, the coil is on the left, with the ring on top of it. Above that is the multimeter for measuring capacitor voltage. Right next to that is the capacitor. In the middle there is the switch, and on the right a high voltage generator for charging the capacitor. This high voltage supply falls into the category “if it looks stupid but it works, it’s not stupid”. It is simply an old 230V-12V AC transformer, but then reversed. The low voltage side is switched with a 50 percent duty cycle square wave using a mosfet (IRL540N). Input voltage is 30V, and switching frequency is 2kHz. It draws about 2A, thus pulling about 60W of power! The high voltage side is rectified with a single diode, and wired to the capacitor. Well, time for some testing. That’s not disappointing for a first test, without any calculations. When the capacitor is charged up to 370V, the ring hits the ceiling. Some quick calculations on energy efficiency. it takes about 12 seconds of charging for the capacitor to reach 370V, while drawing about 50W from the power supply. That is approximately 600 J of input energy. The capacitor holds an energy of E = 0.5*C*V^2 = 150J. The ring weighs 12g. It hits the ceiling at a distance of 1.6m, so say it could reach 2m. Potential energy then is E = m*g*h = 0.24J. Well, that’s not a very high efficiency. That can also be seen as a positive thing. Say that this efficiency can be improved to say 2%, we can launch this ring to a height of 25m. If it can be increased to 10%, well you do the math. That sounds like fun, and there sure is a lot of optimisation possible. This will require some more theory, which will (soon) be covered in the next part in this series.